Never install a driver again - this is reality with the Epson TM-P60II printers. Thanks to Epsons ePOS technology you print from any mobile device such as a Smartphone, tablet or MDC directly from a browser, independent of the operating system. ePOS Print receives XML commands from any HTML5-compatible browser. It could not be easier Connection between the two devices occurs via the integrated 802.11 a/b/g/n Wi-Fi. If you need a wireless mobile printer without ePOS technology, choose the variant with Bluetooth iOS-compatible. Print paper receipts or tickets at 100 mm/sec. Epson offers variants for both media types, to cover a wider field of application. 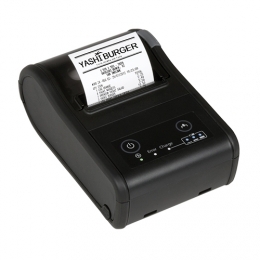 The TM-P60II for receipts is optimal for hospitality the label printer TM-P60II Peeler is better suited for retail. Plus an extra handy feature to save you time and simplify handling while wearing gloves, it automatically separates the labels from the backing material. It ensures for adequate print quality with a resolution of 203 dpi 8 dots/mm.